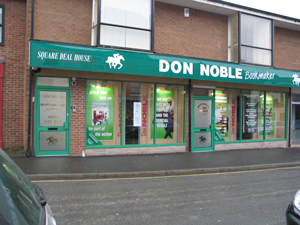 Don Noble Bookmakers was started by the late Donald Noble in Horncastle, Lincolnshire in April 1962, which is still trading to this day, unlike most betting shops which were opened nearly 50 years ago. The current proprietor, Richard Noble joined his father in the family business when betting offices were legalised in 1963 and opened a second shop in Louth, Lincolnshire. Don Noble now operates 9 shops in the areas of Lincolnshire e.g. Skegness, Market Rasen, Chapel St. Leonards, Spilsby etc. In recent years opportunities have arisen to make several betting shop acquisitions - these being; Coalvile, Leicestershire and Bartley Green, Birmingham in 2013 - Saffron Lane, Leicester and Tamworth & Great Barr, Birmingham in 2014 and Sherlock Street, Birmingham in 2015. Bringing the total number of shops up to 15. In 2006 Richard Noble acquired the long established Manny Bernstein Credit Betting business and quickly integrated it into the Don Noble Group and its state of the art Head Office in Louth. Don Noble is licensed and regulated by the UK Gambling Commission.